Iowa had two weeks to prepare for Northwestern. The coaching staff talked a lot about improvements in the run game on both sides of the ball – running and stopping the run. The Hawkeyes looked better defensively in that respect – but regressed offensively. It cost them in Evanston as they lost in overtime to the Wildcats 17-10 in a Big Ten West Elimination Game. And it was Iowa that was eliminated from any further hopes of securing the West Title. Both of these teams have been plagued by slow offensive starts all season. Both continued that in this game. But Iowa carried a 7-0 lead into the locker room at Halftime after another late second quarter touchdown. NU’s Offense asserted itself in the second half – at least enough to score 10 straight points and take a 10-7 lead late into the fourth quarter. 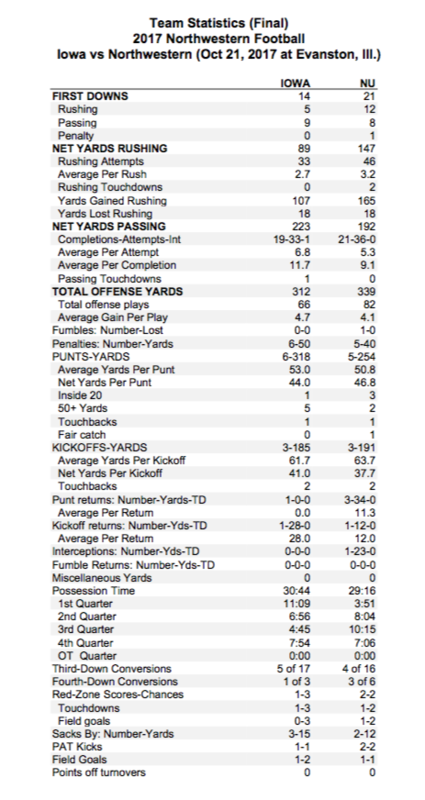 Meantime, Iowa’s Offense could only manage 74 yards of total offense in the second half and overtime combined. Iowa’s effort to improve its run per carry average of 3.4 YPC through the first six games? Not so fast – the Hawkeyes could only manage 89 yards on the ground, averaging a pathetic 2.7 yards per rush. The Hawkeyes could only muster 312 yards of total offense with most of that coming via Quarterback Nate Stanley’s passing. He finished 19-33-1 for 223 yards and one TD with completions to eight different receivers. Running Back Akrum Wadley passed Ronnie Harmon for ninth all-time in program history, but it took him 26 carries to get to his 90 yards total. Iowa had two critical, game-changing breakdowns late – and either one could have changed the outcome. The Hawkeyes had fourth and inches on NU’s 25 yard line and were eschewing the tying field goal for the winning touchdown. But the right side of the O-Line had a collective false start penalty that forced Iowa’s Miguel Recinos to kick the 48-yard tying field goal instead. Then in overtime, needing a first down on fourth and three to keep hopes alive, a wide-open TE Noah Fant dropped a perfect pass from Stanley to seal NU’s win. The Wildcats had scored first in the OT period on a one-yard sneak by QB Clayton Thorson after a dagger 23 yard catch and run by RB Justin Jackson. 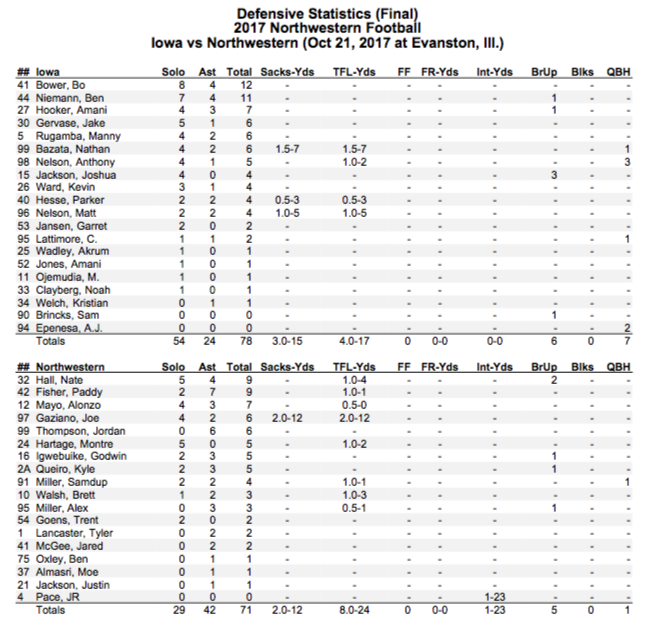 The Iowa Defense played well enough to win – and did so without starting MLB Josey Jewell (shoulder injury) and FS Brandon Snyder (knee swelling). NU finished the game with 339 yards of total offense, including 147 on the ground, just slightly over its 135.2 per game average. But the Hawkeyes were not able to force any Wildcats turnovers in spite of the fact that NU had coughed up the ball 14 times in its first six games. Iowa only had one turnover itself – when Nate Stanley threw just his third INT of the season in the fourth quarter. One bright spot for Iowa in this game was Ryan Gersonde’s punting – with or into the wind – with good hang time and height on his kicks. He was very effective and finished with five punts for a 52.6 yards per punt average. Iowa’s record coming off of bye weeks falls to 8-9 overall under Kirk Ferentz and a woeful 2-8 on the road. Northwestern is now 12-9 vs. Iowa since 1995 and Pat Fitzgerald improves to 7-5 vs. Ferentz and the Hawkeyes. This loss removes any reasonable expectation of Iowa contending for the B1G West Division Title – and leaves the Hawkeyes with a tough row to hoe in terms of achieving bowl-eligibility unless things change dramatically in the last five games. Iowa should be favored at home against Minnesota and Purdue but wins against Ohio State at Kinnick and Wisconsin and Nebraska on the road look highly improbable. Iowa (4-3, 1-3) returns to Iowa City next week to face off against the Minnesota Golden Gophers in the annual battle for Floyd of Rosedale. Northwestern (4-3, 2-2) remains in Evanston and hosts Michigan State next Saturday. Northwestern (4-3, 2-2) defeated Iowa (4-3, 1-3), 17-10, in overtime Saturday at Ryan Field. LB Josey Jewell did not play due to injury, snapping a streak of 37 consecutive starts. Iowa’s linebacker trio of Ben Niemann (OLB), Jewell (MLB), and Bo Bower (WLB) had made 19 consecutive starts together. LB Kevin Ward made his first career start at OLB. LB Ben Niemann moved inside to MLB. The last Hawkeye to start at middle linebacker not named Josey Jewell was Quinton Alston (Jan. 2, 2015 vs. Tennessee). LB Bo Bower (11) and LB Kevin Ward (4) set career highs in tackles. DT Nathan Bazata had a career-high 1.5 sacks. DL Matt Nelson started for the first time this season and for the first time in his career at defensive tackle (14 starts). WR Matt VandeBerg had three receptions for 90 yards. His 61-yard reception in the second quarter was a career long. He has at least one reception in 26 consecutive games played. He has 124 career receptions, 11th all-time, and 1,578 receiving yards, 18th all-time. WR Nick Easley had a team-high four receptions. He has led Iowa in receptions five times this season. RB Toren Young’s 23-yard reception was the first reception of his career. K Miguel Recinos kicked a career-long 48-yard field goal to tie the game, 10-10, in the fourth quarter. Recinos is 4-for-4 from 40-plus yards this season. P Ryan Gersonde punted a career-high five times. He had a career long 61-yard punt and averaged 52.6 yards per punt. Four punts were 50-plus yards, and one was downed inside the 20-yard line. Iowa is 7-5 all-time in overtime games. That includes a 5-3 mark in road games, and a 3-4 record in single overtime. Iowa is 1-1 in overtime games this season (W, 44-41 at Iowa State). Iowa has played two overtime games in the same season for the first time. Iowa scored before its opponent for the first time this season (TE Noah Fant 7-yard TD reception). 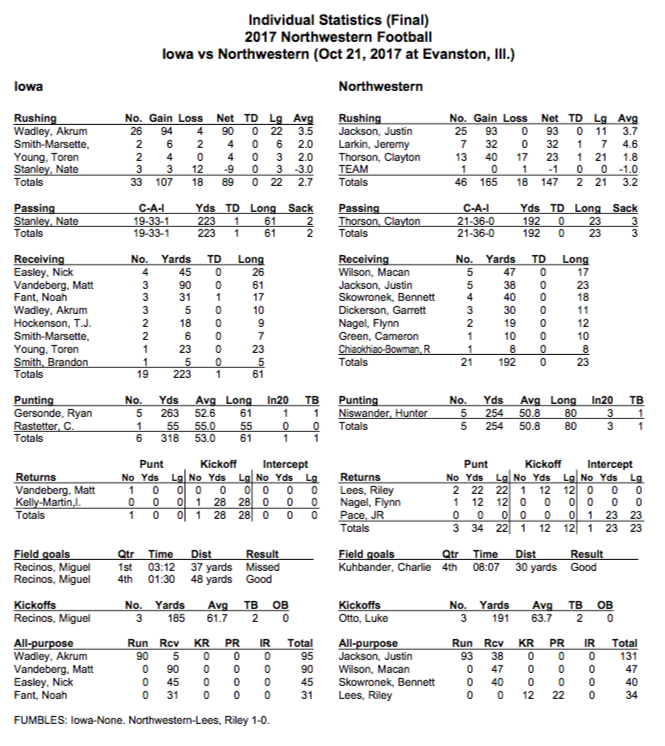 Iowa and Northwestern traded field goals in the fourth quarter. It was the first time this season Iowa did not outscore its opponent in the fourth quarter. Iowa has outscored its opponents 73-23 in the fourth quarter this season. Northwestern won the toss and deferred to the second half. The Hawkeyes have played 234 games under head coach Kirk Ferentz. Iowa has opened the game on offense 180 times (109-71). The Hawkeyes have opened the game on defense 54 times (30-24). The Hawkeyes host Minnesota on Saturday, Oct. 28. Kickoff is at 5:30 p.m. at Kinnick Stadium.